A personal story of survival, hope, and spiritual awakening in the face of unspeakable tragedy. It’s the unfathomable modern legend that has become a testament to the resilience of the human spirit: the 1972 Andes plane crash and the Uruguayan rugby teammates who suffered seventy-two days among the dead and dying. It was a harrowing test of endurance on a snowbound cordillera that ended in a miraculous rescue. Now comes the unflinching and emotional true story by one of the men who found his way home. In this revelatory and rewarding memoir, Strauch withholds nothing as he reveals the truth behind the life-changing events that challenged him physically and tested him spiritually, but would never destroy him. In revisiting the horror story we thought we knew, Strauch shares the lessons gleaned from far outside the realm of rational learning: how surviving on the mountain, in the face of its fierce, unforgiving power and desolate beauty, forever altered his perception of love, friendship, death, fear, loss, and hope. Eduardo Strauch Urioste was born in 1947 in Montevideo, Uruguay. In 1968 he opened an architectural studio with his best friend from childhood, Marcelo Pérez. He has worked as an architect and painter, and for many years he has lectured about his experience surviving seventy-two days in the Andes after the legendary 1972 plane crash on the Chilean-Argentine border. He is married to Laura Braga; they have five children and live in Montevideo. Mireya Soriano is an award-winning Argentinean-Uruguayan writer. She is the author of The Rose of Tales, There Is No Time for More, Let the Sea Cry, and The Sky of the Owl. Jennie Erikson graduated from the University of Washington with a BA in history and anthropology; she earned an MA in medieval archaeology from York University in England; and she has worked on excavation sites in Easter Island, Jordan, England, and the western United States. 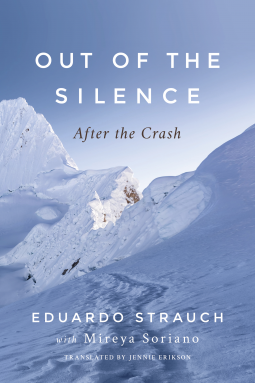 She met Eduardo Strauch on an expedition to the plane crash site in the Andes and has been honored to translate Out of the Silence from its original Spanish and help bring his inspiring story to a wider audience. Jennie lives in Colorado with her husband, where she reviews history books for her website (www.historybookreviews.com) and reads voraciously on every historical subject she can find.